Asser Levy Place will be closed permanently beginning Oct. 28, 2013. 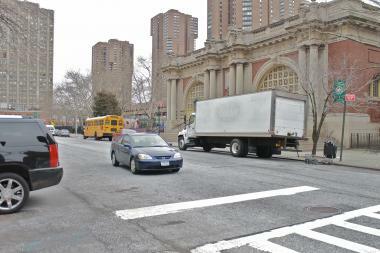 KIPS BAY — A short street next to the Asser Levy Recreation Center will soon shut down permanently to make way for a new park. Asser Levy Place, which runs between East 23rd and 25th streets near the FDR Drive, will be closed on Monday so the city can build a park with an artificial turf field, an exercise track and more, officials announced. Workers have already relocated a water main beneath Asser Levy Place, and once the street is shut down, construction of the new park will begin, said Philip Abramson, a spokesman for the Parks Department. In addition, East 25th Street, which is currently one-way, will be converted to a two-way street. The park, which will have adult fitness equipment, benches, tables, drinking fountains, lighting and trees, is slated to open in about a year. It will be adjacent to the Asser Levy Playground, a recreation center and a pool. The city promised to convert Asser Levy Place into a park in 2011, to make up for the park space the city lost after agreeing to sell a portion of Robert Moses Playground to the United Nations for a new U.N. office tower. As part of the deal, the U.N. Development Corporation also agreed to pay $73 million for open space in the neighborhood, including the rehabilitation of the former Con Edison pier between 38th and 41st streets and an esplanade from 53rd to 60th streets. City Councilman Dan Garodnick gave $1.175 million toward the Asser Levy conversion project and the U.N. Development Corporation provided $500,000. “Open space is sorely needed on the East Side of Manhattan, and this expansion will ultimately mean more open space not only at Asser Levy, but also the whole East Side waterfront,” Garodnick said in a statement.